Nutritionist Patty Keane weighs in on the controversy over school food standards. 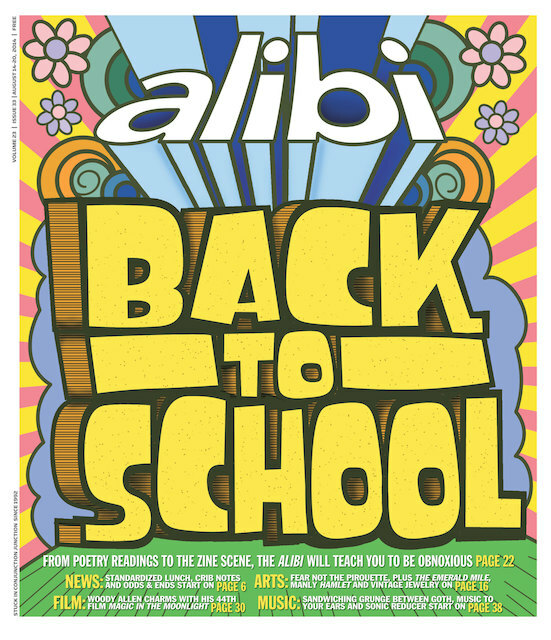 Test your New Mexico news savvy with the Alibi pop quiz. From Oklahoma to New York, it’s funny because it happened to someone else. Wherein August March travels into the past to preview a Nine Inch Nails/Soundgarden/Cold Cave concert. Whether you’re craving electronica, dark wave, Americana or Texan rock, Music to Your Ears has you covered. This week we listened to new releases by David Kilgour and the Heavy Eights, Naomi Punk and Samantha Glass. Now with A/V! ARIES (March 21-April 19): Researchers in Peru have recently tracked down many previously unknown varieties of wild cacao plants. What that means is that there are exotic kinds of chocolate that you and I have never dreamed of, and they will be commercially available within a few years. As delicious as your Chocolove XOXOX Extra Strong Dark candy bar may taste to you now, you will eventually journey further into a new frontier of ecstatic delectability. I propose that we use this theme as a metaphor for the work you have ahead of you right now. It is time for you to make good things even better—to take fun diversions and transform them into experiences that engender transcendent bliss. Turn "yes" into "YESSSS!!!!"